This blog post is part of an occasional series about Gibson family relatives. Family trees are rife with personalities: the mysterious aunt, the curmudgeonly great-uncle, the adventurous second cousin. Join us as we explore some of these colorful characters and learn more about the interconnected nature of Boston high society in the process. On September 2, 2018, Elizabeth Motley Ames died at the age of 99. She had lived just shy of an entire century in Boston and Easton, Massachusetts. A great-niece of Rosamond Warren Gibson’s, she was a passionate preservationist and a longtime supporter of community causes in Easton. The Motley family lived nearby to the Gibsons in Back Bay. 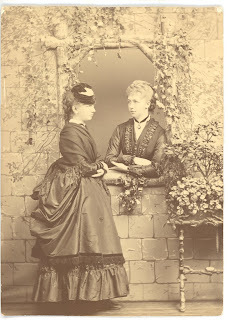 Sisters Rosamond and Eleanor Warren were quite close growing up, born only a year apart; they remained so after they were married. Family lore has it that when the Motley kids walked past 137 Beacon Street, on their way to or from the Public Garden, they’d better not be misbehaving or great-aunt Rosamond would be sure to tell grandmother Eleanor about it straight away. Boston’s Back Bay was a tight-knit community into the early twentieth century. As a young woman, Elizabeth Motley married into a prominent Easton family. Oliver Ames (1779–1863) founded a shovel factory in Easton, Mass. which would go on to become a world-class operation, involved in many key construction events in American history. The Ames family also included several politicians over the years, most notably Oliver Ames (1831–1895) who served as governor of Massachusetts in the late nineteenth century. Elizabeth Motley and David Ames, Sr. were married in December of 1940. The next December, while David was decoding military tapes about the attack on Pearl Harbor, Elizabeth was waiting at home to give birth to their first child, born just twelve days later. After David’s service, the couple returned to Massachusetts and went on to have three more children. Mrs. Ames was a supporter of the Easton Free Library and she and her husband were charter members of the Easton Historical Society. In 2012, they sold their family homestead to The Trustees of Reservations; the Governor Oliver Ames Estate is now a public park open to be enjoyed by all. Mrs. Ames was also a friend to the Gibson House Museum and will be missed by all who knew her. In about 1890, Rosamond Gibson redecorated the front hall of her home at 137 Beacon Street. Her mother-in-law, with whom she had shared the house for nearly seventeen years, had recently passed away. And in the thirty years since the house was built, styles had changed. Rosamond selected an embossed, gold-leaf wallpaper, called “Japanese Leather.” She also chose a luxe red-on-red patterned Wilton carpet. The Wilton style of carpet that Rosamond selected was top of the line. Traditional Wilton-weave carpets have a thick, cut pile that resembles velvet. They were the most expensive to produce and served as a status marker in many wealthy homes. 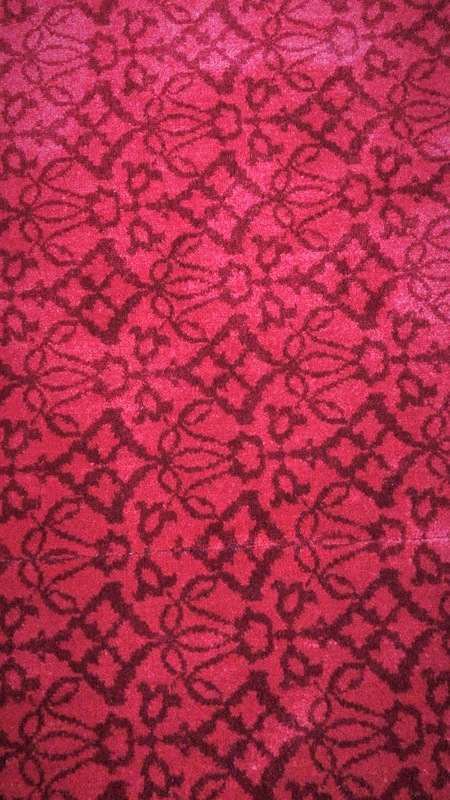 Rosamond’s carpet held up well, but after almost 130 years of use, it became worn and faded. In 2016, the Museum’s Board of Directors, with the help of several generous donors, undertook a project to reproduce a new carpet for the Gibson House. 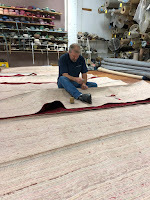 The Museum worked with the J. R. Burrows Company here in Massachusetts and the Grosvenor Wilton Company Ltd., located just outside Birmingham, England, to design a replica of the original carpet. This involved taking samples of the old carpet to the mill, so that the pattern and dye could be matched exactly. The historic Stourvale Mill, where the new carpet was woven, is the site of the first steam-powered carpet mill in Britain. It is a fitting place to reproduce a Bigelow carpet. In August, Pulsifer-Kingston, a carpet installation company in Quincy, Mass., received the carpet bales in the traditional twenty-seven-inch strips and hand-sewed them together in their workshop. Installation took three days. We were proud to unveil the new carpet at the beginning of September. It is vibrant and plush, and complements the wallpaper beautifully. It is now easy to imagine how impressive the house's front hall would have been in 1890. Visit the Gibson House and see the new carpet! Information about guided tours can be found on our website. Bigelow-Sanford Carpet Company, A Century of Carpet and Rug Making in America (1925). Patton, Randall L. "A History of the U.S. Carpet Industry," Economic History Association (no date). Velvet gown with daytime bodice, Charles Frederick Worth (1825-1895), Gibson House Museum (1997.111). There is a gem in the collection of nineteenth-century dress at the Gibson House Museum. 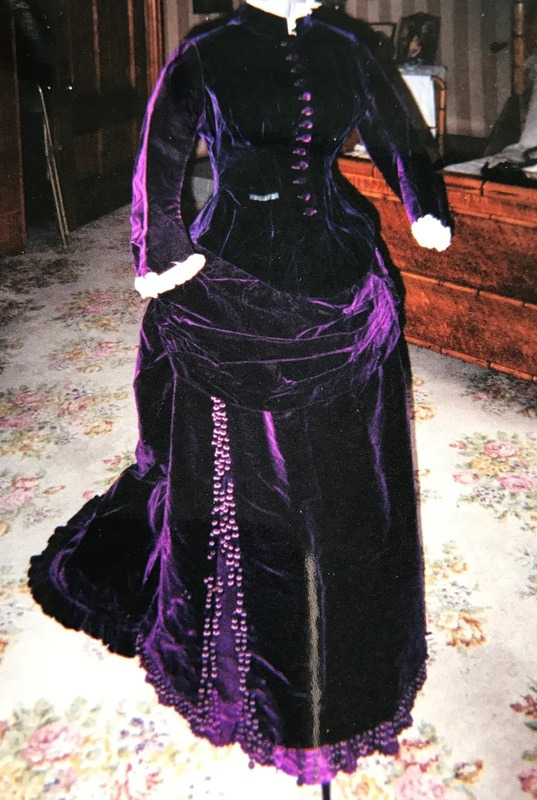 It is a sumptuous purple velvet gown, richly colored and trimmed in velvet ribbon and silk fringe. A drape sweeps off the waist and gathers at the back in a dramatic bustle. The dress has two separate bodices: one for day wear (long-sleeved with a high collar) and one for evening wear, with a low, square neckline. The skirt is stiff from a horsehair lining, and metal stays are sewn directly into the bodice fabric. Likely made in the early 1870s, the dress is a pitch-perfect example of Victorian fashion from that decade. The tightly corseted waist and prominent bustle create a much-desired silhouette, one that shows off a more “natural” form in comparison to the large hooped skirts of the 1860s. In dress, as in most other things, the Victorians preferred a high level of specificity, and the two bodices signify the expectation of different attire for day and evening. Mary Warren Hammond, Rosamond Gibson’s older sister, was the proud owner of the dress. She was married to Samuel Hammond IV, Charles Gibson Sr.’s cousin, and they lived across the street at 116 Beacon Street. In photographs from the 1870s and 1880s, Mary looks elegant and confident, someone to notice. She was clearly a fashionable lady, and it seems fitting that this beautiful gown belonged to her. The dress was made by Parisian couturier Charles Frederick Worth. Born in England, Worth moved to Paris in 1845 and found work at Maison Gagelin, a luxury textiles firm. By 1860, he had set himself up with his own dressmaking business and by 1870, he was the most sought-after designer in Paris. He was especially known for his use of luxurious fabrics and trimmings. What explains Worth’s popularity? Part of his success was due to the patronage of Empress Eugénie; after seeing a Worth gown at court, she treated the House of Worth as her official dressmaker. Worth was also innovative in business. He used live models, rather than mannequins, to show off his designs to potential customers. Clients like Mary Hammond would visit his offices at 7 rue de la Paix and select from the clothing on view. Chosen items would then be tailor-made for the client. His popularity spread through fashion magazines, and many wealthy American women traveled to Paris to visit the House of Worth, where he put on fashion shows and created seasonal collections. Due to these innovations and to his immense popularity, Charles Worth is considered by many to be the father of haute couture, or high fashion. Tucked into the Gibson House Worth dress box, a handwritten rectangular label reads, “Aunt Mary’s Worth Dress.” It’s the only item of clothing in the house that Charlie personally labeled, giving us an idea that he, too, understood its value and beauty. 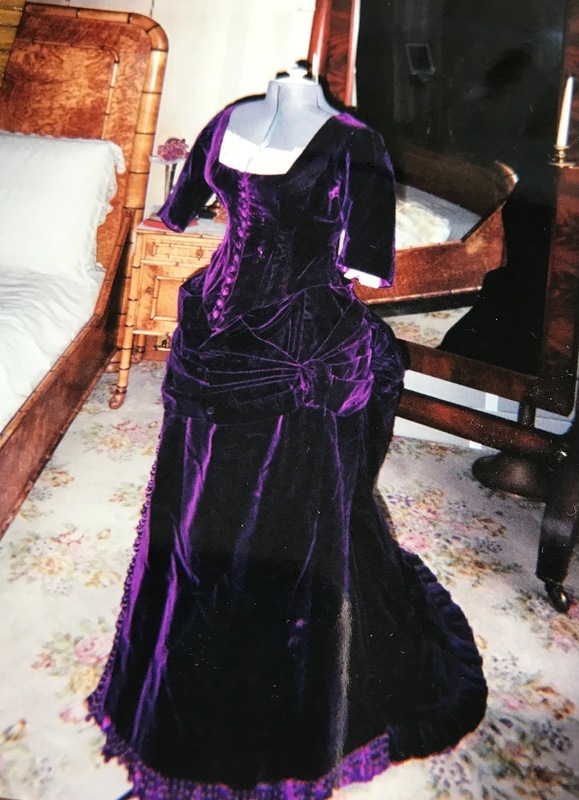 The Charles Worth gown will be on display at the Gibson House Museum May 30–August 12, 2018. Visit the Gibson House Museum website to plan your visit, www.thegibsonhouse.org. 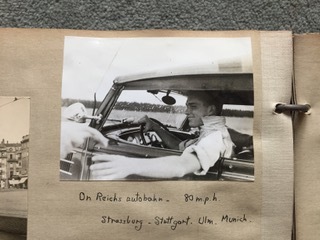 This blog post is part of an occasional series about the Gibson House Museum Archives, a repository of personal documents and photographs from the Gibson family. The archives are accessible by appointment; contact curator@thegibsonhouse.org to make arrangements. 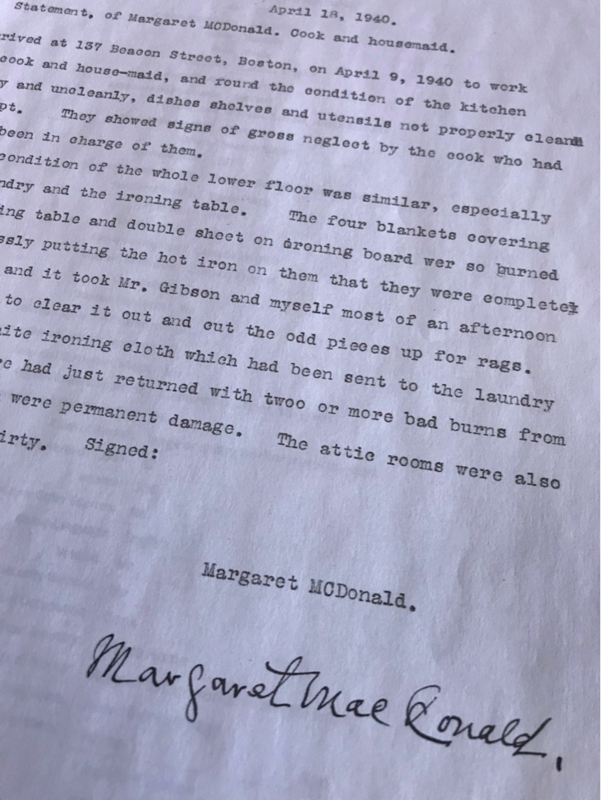 In 1940, Margaret MacDonald came to work as a cook at 137 Beacon Street. Charlie Gibson, Jr. had been living at the house, largely alone, for the previous six years and from a statement Ms. MacDonald signed, it sounds like things were not going all that well. 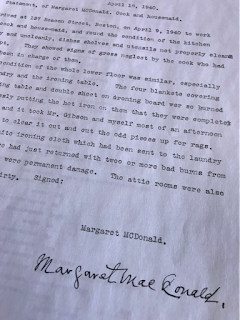 Ms. Mary MacDonald’s signed statement, April 18, 1940. This was likely written by Charlie and signed by Ms. MacDonald in response to a dispute with a previous employee at 137 Beacon Street. Charlie had officially moved back to 137 Beacon Street in 1935, after his mother Rosamond died. He likely needed some help keeping the house in clean and working order, so he would have hired a cook or a chambermaid. Why did things look so shoddy in 1940 when Margaret MacDonald arrived? Was there a cook at the house at all between 1935 and 1940? Where was Charlie eating? Let’s back up a bit. Before Charlie returned to 137 Beacon Street, he “took rooms” at a number of different addresses in Boston. He spent twenty-five years at 121 Beacon Street, just down the street from his childhood home; that property had become a lodging house in the 1880s. In nineteenth-century cities like Boston, boarding houses were an important housing option for all manner of people–young and old, rich and poor–who weren’t able to, or chose not to, live at home. Boarding houses provided meals and other domestic services, like laundry and housekeeping. This was a great option for an unmarried gentleman like Charlie. By 1900, however, many boardinghouses were in fact lodging houses–basically, the rooms without the meals. So, Charlie Gibson, a long-time lodger, would have been used to eating his meals elsewhere than in his home. It may be that when he moved back to 137 Beacon Street, he chose not to employ a cook, and the kitchen went largely unused. If that’s the case, where did he eat? Some lodgers might return home or take meals with friends. It seems likely that Charlie did that, since he was around the corner from his childhood home and had many friends and relatives in Back Bay. 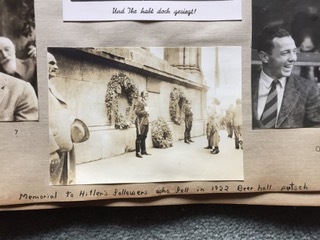 A page from Charlie’s daily journal, November 19, 1934. 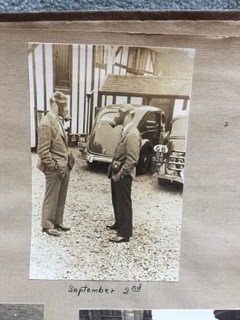 Courtesy of the Gibson House Museum Archives. 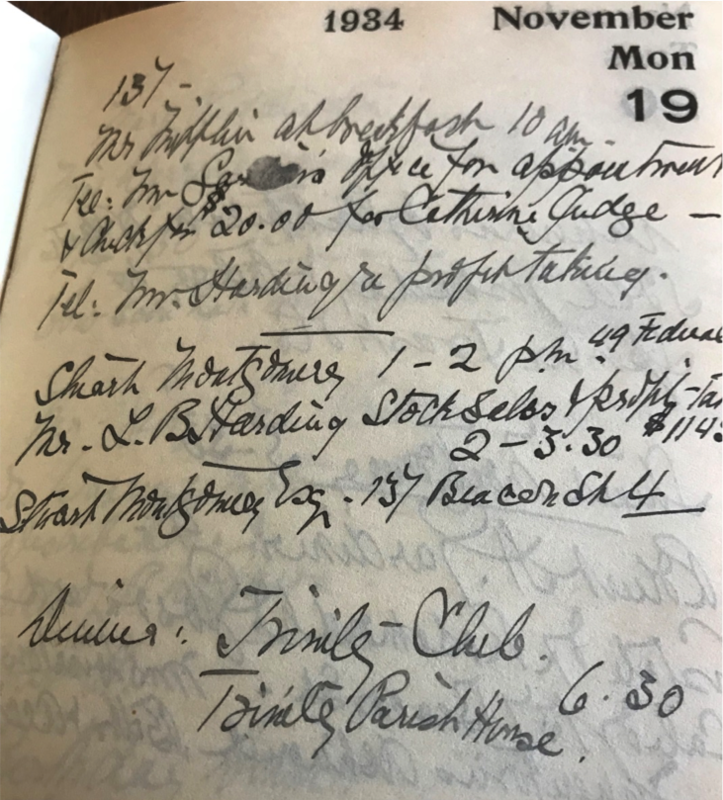 His daily journals also contain clues about his eating habits. 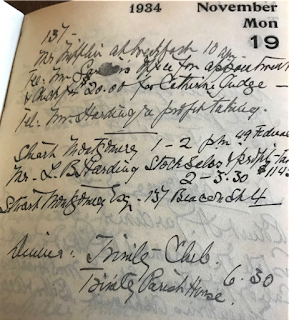 Monday, November 19, 1934: “Dinner, Trinity Club, 6:30.” Monday, December 10: “Dinner, Episcopalian Club, 6.” Private clubs abounded in Boston, and many Boston elites preferred eating at clubs to restaurants, as they were exclusive and membership afforded diners another opportunity to declare their social status. But restaurants were increasingly popular, too, and hotels like the Fairmont Copley served a daily dinner that became a prestigious social event for Back Bay residents. Restaurants “were secure, predictable places of association, where people could stake out social space in the city,” writes culinary historian James O’Connell. Maybe the state of the kitchen at the Gibson House in 1940 was due to Charlie’s preference to dine out in Boston. · Wendy Gamber. The Boarding House in 19th Century America. Baltimore: Johns Hopkins University Press, 2007. · James C. O’Connell. Dining Out in Boston: A Culinary History. Lebanon, NH: University Press of New England, 2017.